fantasy art and tree chatter of aquariann: WW: World's Smallest Grape Tomato? WW: World's Smallest Grape Tomato? My mom found this tiny tomato in her salad at the Lobby Bar in Dover Downs. Isn't it adorable? It was delicious, too. Mmm all that rich flavor and color packed into one teeny tiny tomato. So cute! The only tomato plant I sucessfully raised so far was a wonderfully productive one, with tomatoes this same size! Many many tomatoes were harvested, but you needed something like 100 per portion! Very interesting! Thanks for sharing and hosting. Happy WW! Oh my, that is tiny! Too cute! Happy Thanksgiving to you and your followers! Thanks for hosting, as always. I've heard that small fruit can really taste the best. Was it good? That is so cute! I want that little mater! Wow! That is super tiny! so tiny, my favorites though! I can eat them like candy! Oh my goodness - it's tiny! I could eat that in one bite. I hope you weren't too hungry. That's not much of a salad. LOL Really, that's an interesting and neat shot. =D Thanks for hosting another week of WW! Almost too small to taste! Fun photo. Sometimes the smallest things have the most taste. If you didn't eat it yet you could enter it in the Guiness Book of World Records! Oh my, how tiny! Very cute. Love the quote that goes along with today's Wordless Wednesday! That's the most tiny tomato I've ever seen. lol...that is very tiny!! Did you eat it? That has to be the smallest tomato I have ever seen lol it looks like a plum tomato. Oh my gosh... it's so itty bitty. We've gotten some teeny cherry tomatoes, but nothing quite that small this year. It makes a great subject for photography too! In the spirit of American Thanksgiving – thanks for participating on my meme – I also wish you and your loved ones a healthy and happy holiday season! 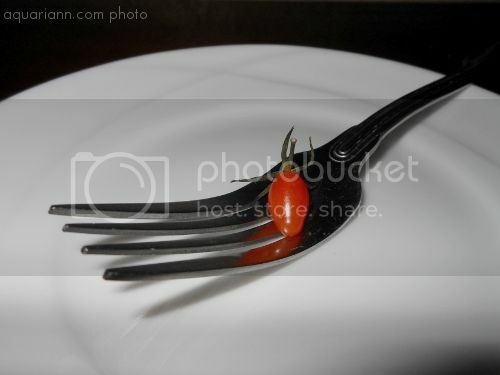 The tomato looks beautiful against the white plate. The smallest things can have the biggest impact & the most flavor.